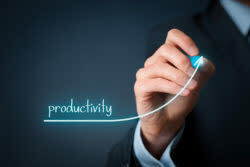 Staying productive at work on a slow Monday, that sleepy 2 o’clock hour, or any other day, can be challenging at times. That’s why we’ve put together a list of 14 things you can do to stay productive every day of the week. A to do list helps you set realistic, short term goals. Furthermore, crossing off completed items creates motivation to keep going. Don’t count on your brain to remember what you need to do each day. Make a list and then get it done! Then make an hourly plan. If you have a standing desk, use it! Standing up increases blood flow and mixes things up. If you don’t have a standing desk, just try standing up every hour or so. You don’t have to keep working that way, but the movement should wake you up and help you focus better. Studies show that a short break every 90 minutes can boost productivity. Even a 5-minute break can give your brain a chance to rest and get ready for your next task. Most of us don’t drink the amount of water that we should each day, and it turns out that drinking water can actually increase productivity by 14%. Add fresh fruit or mint leaves to your water for extra flavor. It’s easy to get distracted when your smart phone is sitting on your desk. A text message interrupts your current train of thought, or a news notification takes your focus off the project you’re working on. Try turning your phone off for a few hours a day, or just when you have a pressing deadline. Or, disable social media notifications. If you can’t turn your phone off because you need it for some work-related activity, at least turn off social media notifications or log out of your accounts entirely. Social media can be a major distraction during the work day, and it’s too easy to waste more than a few minutes scrolling your Instagram. Get that daunting task over with. Don’t save your most-dreaded task for the afternoon lull. Determine to start working on it around 9am, when it’s still early but you’ve had time to get your brain going. You’ll feel like a champion when it’s done before lunch! During one of your breaks, take a walk around your office building or outside if you’re able. If you have a one-on-one meeting scheduled, consider making it a walking meeting, rather than meeting in a conference room or office. If incentives keep you motivated, treat yourself with a gummy bear or some M&Ms every time you complete a task. But stay disciplined; indulging in a treat whenever you want defeats the purpose. Did you know that multi-tasking actually leads to a 40% decrease in productivity? Stop trying to juggle too many tasks at once. Keep your to-do list close by, and choose one item at a time to complete. You’ll find that you complete things faster and more efficiently. Eat a healthy snack every few hours. Avoid sugary snacks that trigger a sugar crash, and opt for foods like nuts, raw vegetables, fruit and nut bars, etc. Meetings are important, but they can be time wasters. Are you spending 15 minutes in small talk at the beginning and the end of every meeting? Rather than blocking off an hour of time for a meeting, only block off 30 minutes. This will force you to spend your time discussing the project at hand, rather than catching up on what’s new. If you’re brainstorming for a project and making no progress, ask for help. In situations like this, you could actually be wasting more time by trying to do it on your own. Collaborate with a coworker or two and bounce ideas off of each other. Just be sure to put a limit on the brainstorming session.